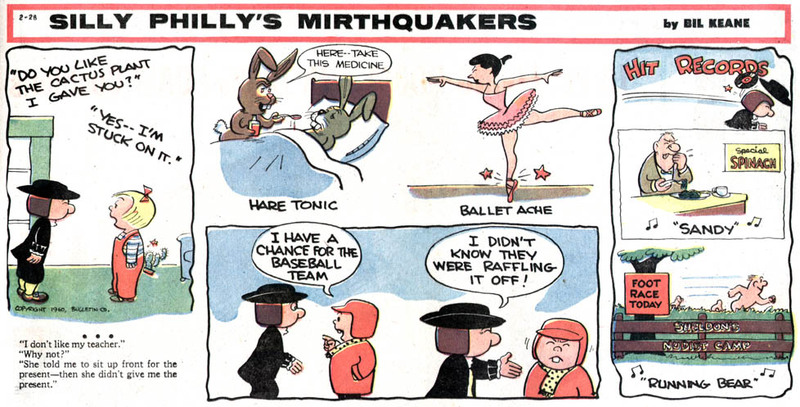 The feature started in the back pages of the paper’s Sunday Fun Book on 4/27/1947. The Fun Book featured Will Eisner’s The Spirit plus additional local features like Sports Stars and It’s Philadelphia (both of which will probably pop up here eventually as obscurities of the day). The Fun Book eventually folded, and Silly Philly was promoted into the paper’s regular Sunday comic section. There it ran until 9/3/1961. Presumably Keane decided to end the feature as the Family Circus gravy train started rolling. Actually I’m planning a post on Channel Chuckles tomorrow. Couple years ago, there was a “Family Circus” Sunday where Billy was watching “Silly Philly” on television. I think I still have that somewhere.